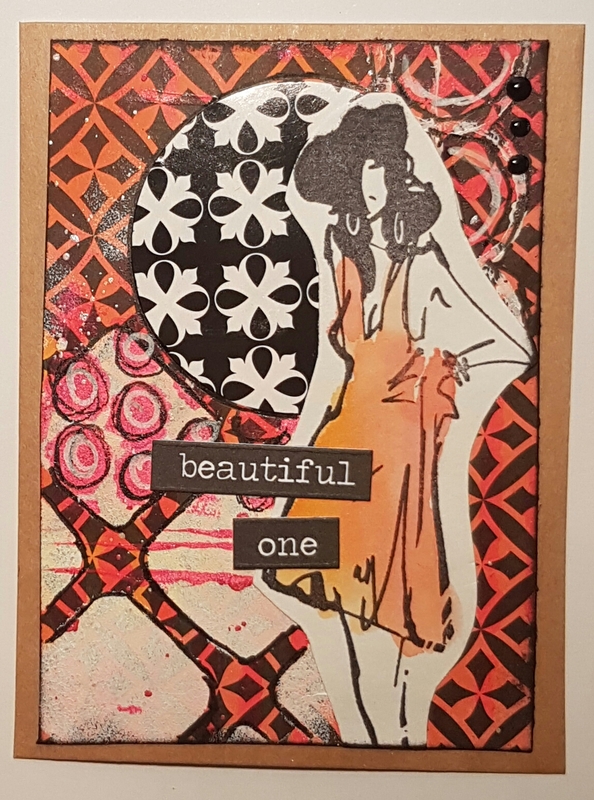 It’s been a while since I managed to do a Paperartsy challenge … but I kept seeing amazing art both on the blog and from my friend Hazel who has made three different projects already (all of which are stunning) so I had to join in. Last night was the night to get in the zone and do this! The first DT project by Corrie I loved and although my make was nothing like hers it still inspired me to get my colour going! The first challenge for 2017 is a colour scheme… pink and orange! Lovely and bright and zingy. Of course in keeping with this year’s challenge I had to make some ATC’S. 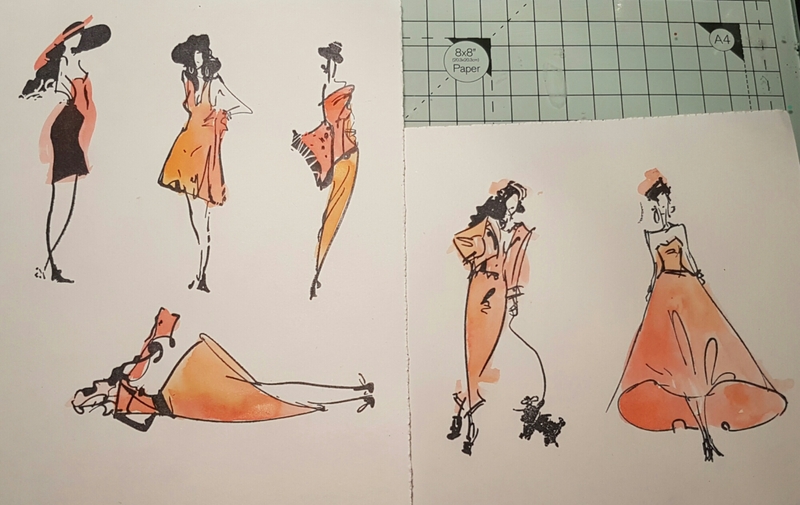 So I grabbed some paper which I got in the sale at M & S as part of a stationery kit… and went to town with abandoned coral and carved pumpkin distress stains. 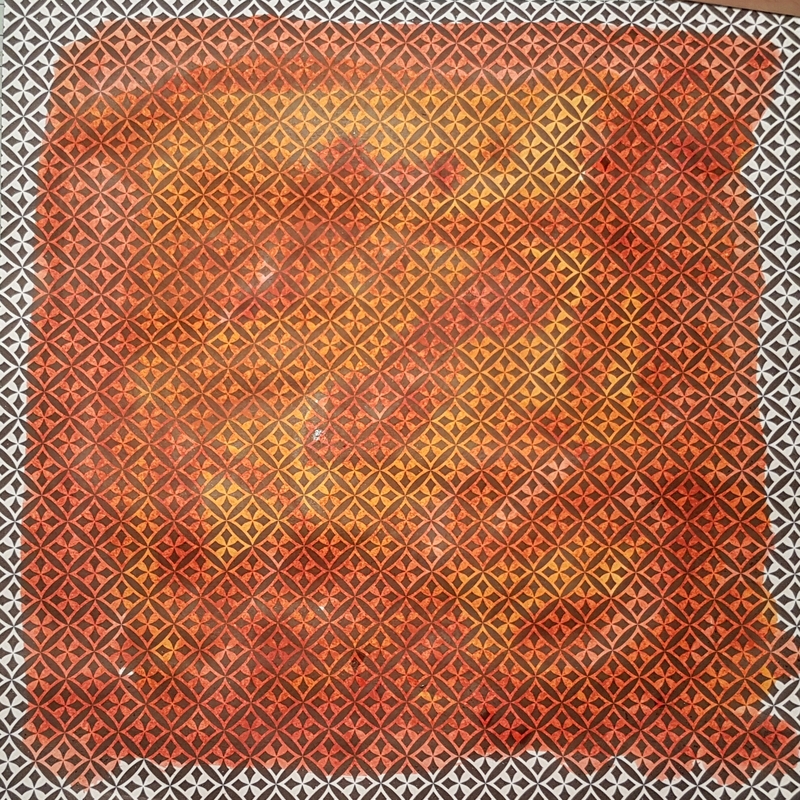 I didn’t bother going to the edges as I knew that on this 8 x 8 paper I wouldn’t be using it all. Next I grabbed some neon pink paint. This is DoCrafts fabric paint but I use it quite often on my papercrafts and never on fabric! 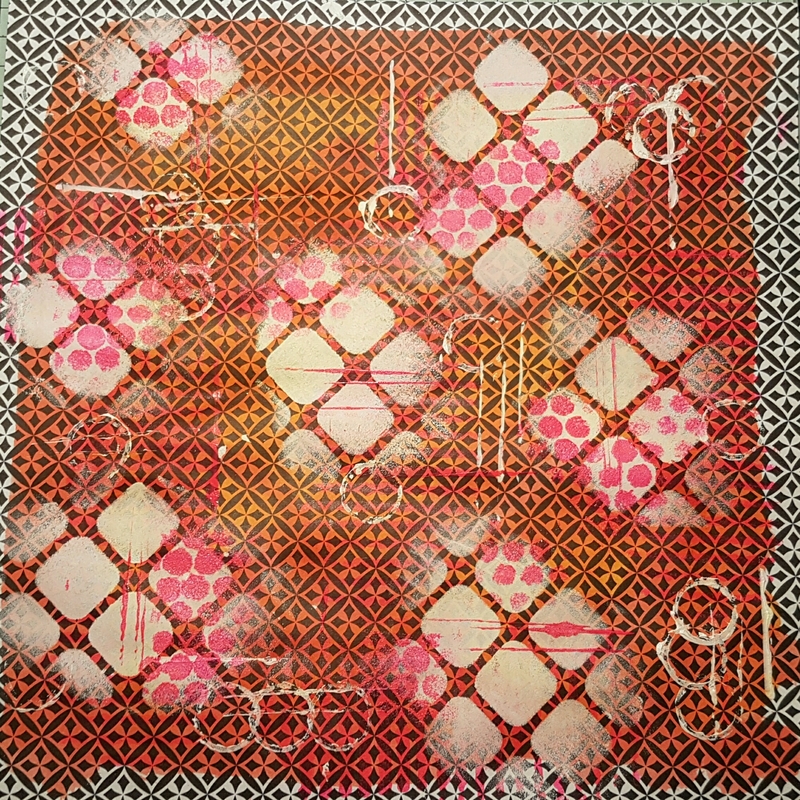 I grabbed a stencil and added some onto the background but the paint is translucent so barely visible. So then I got out some gesso and an open design stencil so I could provide a base for the pink paint. That’s better.. more stencilling and stamping with bottle tops and credit cards and all that remained was some speckles! For this I used the metallic paints from Finnabair to also add a bit of a sheen. 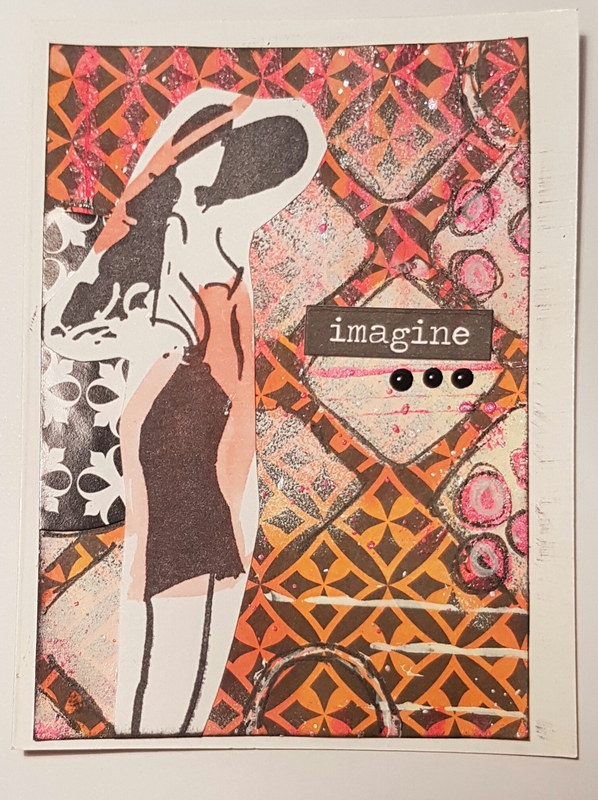 So I then cut up the pieces into ATC size and added stickers that were included in the stationery kit. Right onto the focal images. 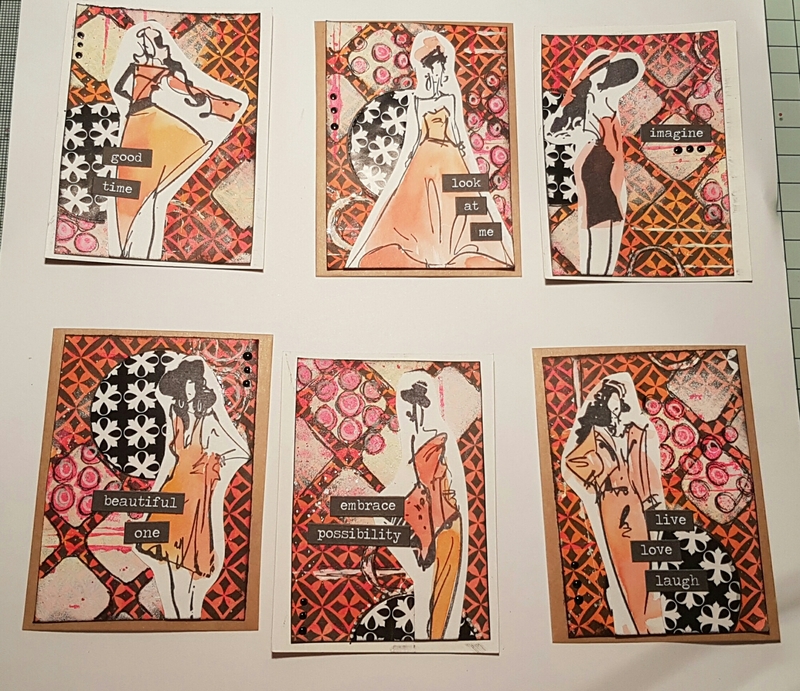 I wanted to keep them all in one theme and happen to have very recently bought some stamps that I knew would work perfectly… these Tim Holtz Runway ones… stamped in archival onto white cardstock and loosely coloured with the distress stains… perfect. I cut them out with a reasonable border and then adhered them to the backgrounds. They are slightly larger than the atcs so they did loose legs etc… and in one case the dog! 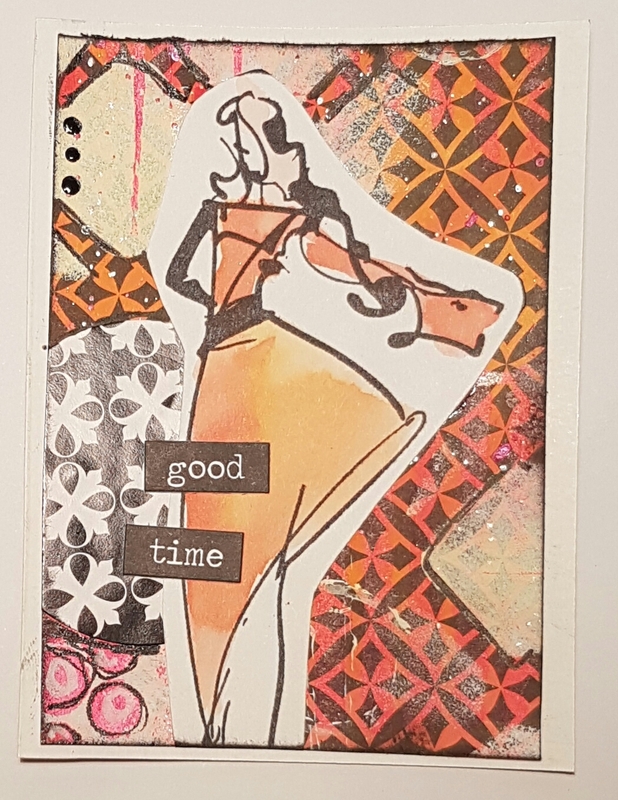 Then I decided to trim them down and add them to a cardstock base that I cut out of the postcards from the same kit… they had cute postcard style cards and they were perfectly 2 atcs for each… so I did half on the kraft side and half on the white. Oh I and so edged each of the panels with ink before sticking it down. Next up… doodling. A bit of doodling and outlining and then some stickers for sentiments. And here they are… gorgeous even if I say so myself! I also added a little bit of enamel accents on each just to add a little more texture. 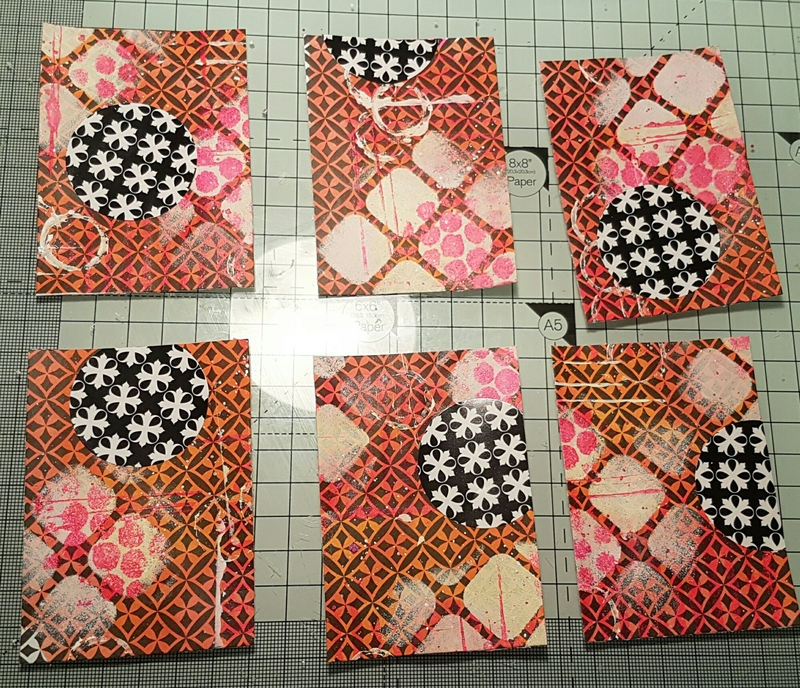 So that’s another six atcs made towards my challenge… I am way ahead of schedule (16 ahead already) and really enjoying this challenge. 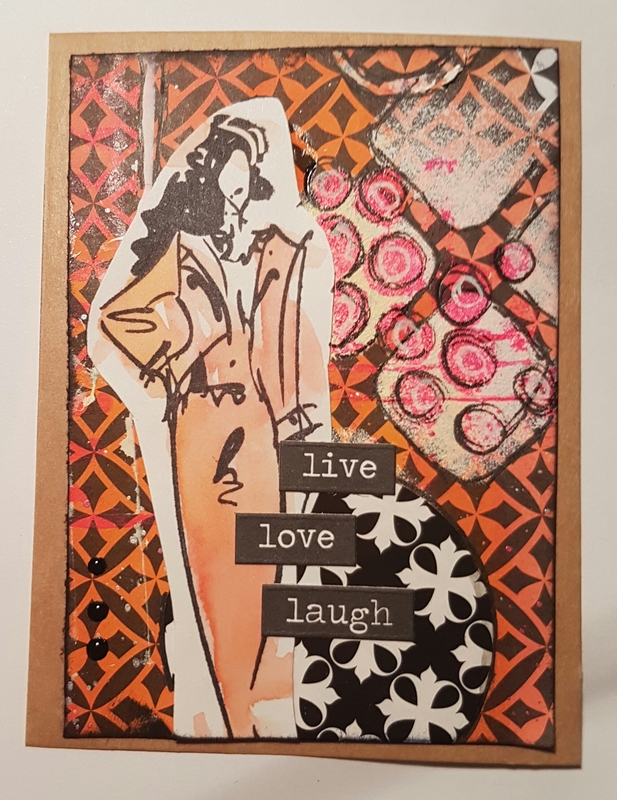 I also love joining in with the Paperartsy gang for the pink and orange challenge… I do realise that I didn’t use any PA products this time … but I have an idea for another project using these colours and PA products so if idea get a chance in the next couple of days I will be back with that one too. 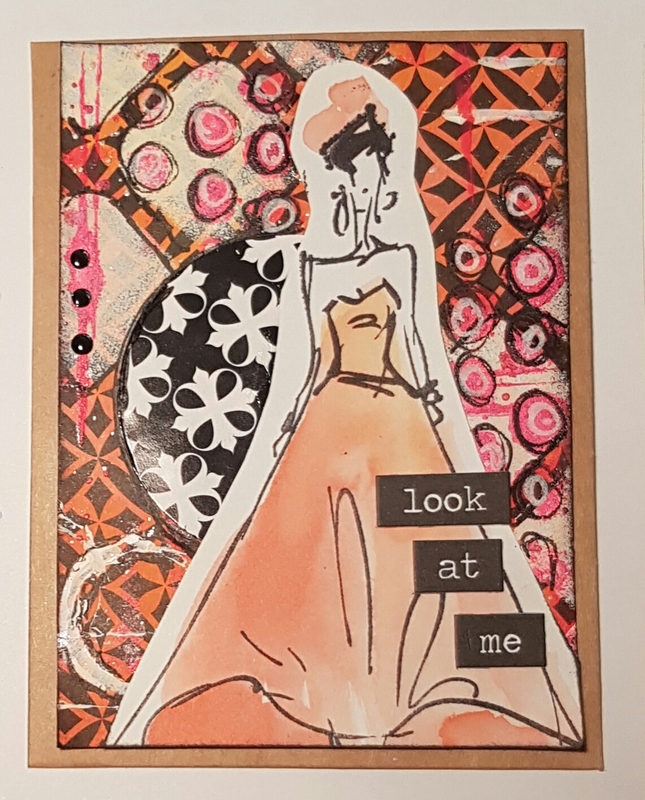 In the meantime check out the Paperartsy blog and all the fab inspiration. These look gorgeous; absolutely love them! These are gorgeous. I love the geometric backgounds, they compliment the sketchy style of the TH runway girls so well. 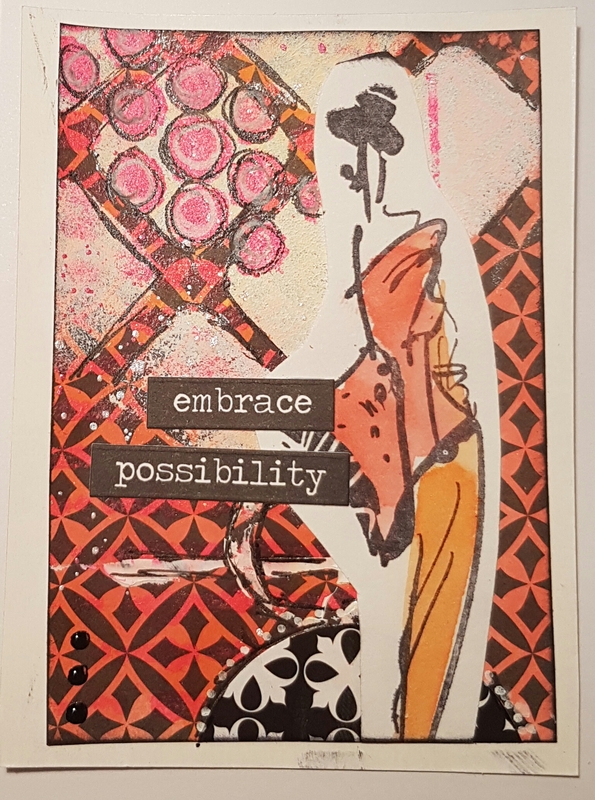 Fabulous ATCs.